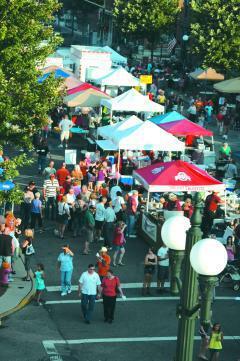 Did you know that Central Ohio is home to more than just one Jazz & Ribs festival? Jazz fans can catch some great jazz this weekend at the London, Ohio Jazz and Rib festival. Originating in 2008 as a revitalization of London’s First Friday schedule, the 2011 Rib & Jazz Fest saw almost 10,000 people and every rib vendor selling out of the nearly 5,000 pounds of ribs! This year’s festival will surely be bigger and better. 11 a.m. – 1 p.m. — The John Vermeulen Octet is a smaller jazz/dance orchestra that has played various functions from weddings to the Galion Oktoberfest. John Vermeulen began playing swing music while attending Capital University in the late 70’s. Currently John plays in Vaughn Wiester’s Famous Jazz Orchestra and Johnny Mack’s Superband. 4 – 6 p.m. — The Linda Dachtyl Trio features multi-instrumentalist Larry Smith of Columbus, organ recording artist and Keny on College jazz piano and percussion instructor Linda Dachtyl, and Percussive Arts Society Ohio chapter president and Kenyon College percussion instructor Cary Dachtyl. 9 – 11 p.m. — Kick N Flava is a high energy Contemporary Jazz/R&B six member band featuring Mike Allamby on saxophones, Jerry Hawes on keyboards, Claude Coatie on lead guitar, J.D. Williams on bass guitar, Brian Smiley on drums and percussionist David Matthews. In addition to the live music, the festival includes entertainment for the entire family with a car show, motorcycle show, pie and cupcake eating contests, the rib tickler bicycle ride and 5K, and various kids activities. London Ohio is in Madison county, just about 30 miles southwest of Columbus. Simply drive out 70 West for about 20 Miles and take Route 42 South right into London. It couldn’t be easier. Next post: Park Street Jazz Jam Celebrates 8 Years!